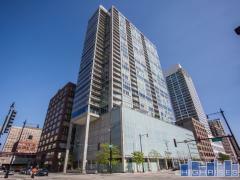 235 Orleans is a unique new development in Lincoln Park. The building, originally a parking garage built in the 1930's, has been revamped with a preserved exterior and luxury modern condos inserted within its walls. The addition will soar an additional 5 stories above the original building with floor to ceiling walls of glass. Completion is anticipated for early 2018. Have any comments or questions about 235 Orleans? Ask your question and/or share your thoughts about this Building.